It’s 1963. In the spring of that year, Eugene “Bull” Connor, the Birmingham, Alabama police chief, unleashed high-pressure water cannons and police dogs on civil rights marchers, including children. By early June, George Wallace, the Governor, was standing on the steps blocking the admission of black students to the University of Alabama. After watching the scene at the University unfold on television earlier that day, President Kennedy addressed the Nation on his intent to introduce Civil Rights legislation guaranteeing African-Americans equal voting rights and an end to segregation. Sadly, the same night the President spoke to the Nation, Medgar Evers, one of the leaders of the NAACP, was shot dead in the driveway of home returning from a civil rights meeting. African-Americans began mobilizing as never before. Led by Dr. Martin Luther King Jr. and other Civil Rights leaders, including A. Philip Randolph, president of the Brotherhood of Sleeping Car Porters, black leaders planned a massive protest in Washington in support of civil right legislation and economic opportunity. They met with President Kennedy, who initially was cool to the idea of a March on Washington because he was concerned, as were many, with the potential for violence and thought it would jeopardize passage of civil rights legislation. The March on Washington for Jobs and Freedom took place on August 28, 1963. A quarter of a million people jammed the Mall, streaming in by bus and train, walking up Capitol Hill from Union Station. At the Lincoln Memorial, Joan Baez, Odetta, Bob Dylan, Peter Paul and Mary and Mahalia Jackson performed for the massive crowds while millions more watched on television. Baez sang “We Shall Overcome” while Dylan sang “Only a Pawn in their Game” about the death of Medgar Evers. But it was Mahalia Jackson, the “Queen of Gospel” who sang just before Martin Luther King’s famous speech and who rocked the crowd with her famous rendition of “How I Got Over,” referring to the struggle of African-Americans to conquer slavery, racism, discrimination and injustice down through the centuries. “Tell Them About the Dream, Martin”. Dr. King himself was tragically assassinated in April 1968 around the time he was planning the “Poor People’s Campaign” to include an occupation of Washington, DC. Today, much of Dr. King’s work remains unfinished, particularly on the economic front. More than a half century after his speech, far too many African-Americans and others continue to live in poverty, particularly in major cities of this country, denied basic rights to decent housing, education and health care, and often unjustly incarcerated because they are forced to live in poverty-stricken environments where crime and drugs prevail. We can address these issues, but it won’t happen with politics as usual. It will take another movement reminiscent of the Civil Rights movement of the 1960’s, one that picks up where Dr. King left off. The greatest tribute we can pay to Dr. King is to carry on his work. Hopefully we are seeing the birth of that new movement today in the campaign of Bernie Sanders, the Black Lives Matter movement and others calling for a “revolution” in how this country addresses issues of race, poverty, injustice and economic inequality. 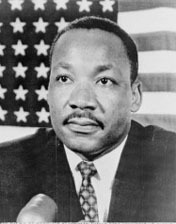 Regarding this quote from above, “The greatest tribute we can pay to Dr. King is to carry on his work.”, how true it is. We in America talk a good game. We go to churches, synagogues and other religious and spiritual gathering places and we talk about God and God’s Will. But as so many of us in America know, for too many Americans, talk is cheap. We, the inheritors of our nation created by wonderful if also imperfect ancestors, still have so much to do before we can claim to be a great nation. And when it comes to today’s descendants of America’s slaves and America’s victims of American segregation, we in America, all of us, must do all that we can to repair and fix that segment of our people before we can honestly begin to feel good about ourselves as a nation.